The sun was down behind the hills when we got to Standing Rock. We had hoped to pitch our tents before dark, but the sky was losing color fast. “We should be here” I said, peering down at the map, then back out the windows of our rental van. “We didn’t pass it, did we?” I was talking to myself as much as to my three road-tripping companions. Ahead of us the road curved sharply around a prominent, symmetrically-sided hill. At the very top of the hill, a solitary Native rider stood perfectly silhouetted against the fading sunset. The sight was so surreally iconic I momentarily convinced myself it was fake, a statue or something. But then the rider wheeled his horse and was gone down the other side, vanishing like some mystical apparition. We rounded the slope below the now riderless summit and suddenly there was the camp, a disorderly slew of flags tents tipis and yurts sprawled out across the flood plain, Lake Oahe visible in the distance and tan hills dotting the horizon. Big floodlights strung along the hilltops marked the progress of the Dakota Access Pipeline. It was almost at the water. Going to Standing Rock was a half-baked proposition I made to my partner Ash over dinner one night late in October. We were already going to Chicago to visit my family. North Dakota wasn’t far from Chicago, and besides, what did we honestly have better to do? We hadn’t started work yet, so nothing was stopping us except our own hesitation. We were accustomed to challenging the system and its injustice in the way of the educated middle class, which in our case meant respective careers in women’s health and the environment and bringing reusable bags to the grocery store. But a Wall St. backed oil company and para-military police force yet again spitting on the basic human rights and dignity of the original, Native Americans went against everything we stood for. If we didn’t go do something, who the hell else would? Things snowballed quickly once we made the decision. My buddy Sto in Chicago was already going with his class but would ride with us. Ash was in touch with other midwives and herbalists working at the medic tent who gave us a list of supplies to deliver. From the thousand bucks we crowdfunded, we used a little for the medic supplies and planned to get the rest to tribal leaders by hand-delivering a check. We also went around to local department stores asking if they’d donate gift cards to Standing Rock. At the last minute my cousin Paolo hopped on for the ride. He had just graduated college– restless, bored and pissed off about where things were headed. That made four of us. Trump won the election three days before we planned to leave. Bitter, demoralized, and reeling from the blow, going to Standing Rock felt that much more necessary and significant. It was the first act of resistance, an alternative to bemoaning America’s stupidity on social media, a real and positive action to counter all the negative feelings threatening to take hold. A pilgrimage, of sorts. 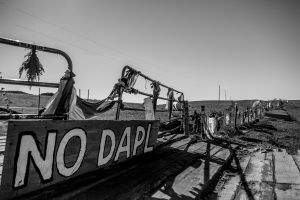 With what felt like the whole world crumbling around us, Standing Rock was where we would rally and hold, “the moral center of the universe,” Bill McKibben had rightly said. My first impression of Oceti Sakowan camp was a flowing scene of colorful, earthy people and material pulsing with a kind of free-form, decidedly non-commercial energy. It was a good vibe. There was a rare feeling of possibility, of loose electrons in the air. We set up camp in the dark by the river, a bit bewildered by the total lack of direction from anyone, then walked across the bridge to the main camp, to the big fire where everybody else seemed to be going. After hot tea, live music, and dancing in big happy circles of warm, friendly faces, we went back the way we’d come to our tents. It was cold and clear and still on our side of the river, but across the way the camp was still wide awake celebrating. Smoke rose from the campfires and tipis while dogs barked and starlight shimmered on the obsidian surface of the water. The beating drums and singing went deep into the night, and my last thoughts before drifting off to sleep were that we had arrived somewhere very different and very special. We awoke early the next morning and experienced the renewed excitement of seeing everything dreamlike from last night now fresh and sharp in the light of day. The sky was bright, blue and crisp enough to see our breath. Still wide eyed taking it all in, we fell into line with the other bundled bodies shuffling their way towards breakfast. We passed morning campfires coming to life, nodding hello and good morning to the puffy-eyed faces emerging from trailers and tents until we reached the camp kitchen- an old green canvas army tent with long tables of food, shelves of kitchen utensils, and a couple oldschool green colemans burning away. After eating we did dishes, initially looking for guidance from someone in charge but quickly realizing the organic, non-order of operations. It was simple- help out where you see help is needed. Camp kitchens ran not on orders handed down from the top, but on the diffuse efforts of individuals taking their own responsibility and initiative. We soon came to learn this was one of the camp’s main organizing principles. Everyone was their own master, implicitly expected to find their own ways to help out by diving into both specific tasks suited to them as well as common chores like dishwashing. Such a free form system meant some folks naturally worked harder than others, but its hard to stay a freeloader for long when you notice everyone working around you, and that they notice you. In this way the camps managed to do something most communities can’t or won’t, keeping the thousands of inhabitants warm and well fed despite many arriving totally unprepared to do so themselves. Entering the main camp after breakfast we came upon a flurry of excitement and activity at the gate, where idling cars and clusters of people were forming up. A few Native guys were standing there giving instructions. “Alright, everyone who wants to be in the action find a car.” We asked people next to us what was happening. They said there was going to be a prayer walk and ceremony at one of the pipeline construction sites in Mandan. The police were expected to be there in force. Anyone who went was risking arrest. Just as we started to feel caught in the hubbub and wondering what we should do, an elder in a long, beaded blue shirt motioned us over. He asked if we wanted to join the action and we told him we’d arrived only yesterday and were thinking we should go to orientation first. People the night before had said it was important. We didn’t tell him about the promises we’d made to each other and to our families to not get hurt or arrested. The man pointed us towards a huge geodesic dome not far from the center of the camp, where we’d danced the night before around the sacred fire that was always kept burning. A little reluctantly, we headed that way, the opposite direction from the crowd mobilizing for the day’s action. We got to the geodesic entrance, a big horse trailer, generator and cistern in front, and made our way inside. The space inside was huge, big enough to fit at least a hundred people and filled with almost as many, some standing against the dome’s PVC frame but most seated on the ground and filling in towards the center. We were some of the last to arrive, planting ourselves cross legged near the center just as opening prayer began. Prayer ended and we walked straight from the dome to a neighboring (by now ubiquitous) green canvas army tent for orientation. Filled again with everyone standing, even people outside listening through doors and windows. A short-haired, androgynous woman named Daren talked about why we’re here and importance of leaving preconceptions at the door. From whatever reasons we came, we were here now for prayerful ceremony and defeating the black snake through nonviolent direct action. We needed to be conscious of indigenous-centered space and its difference from white-centered space. Conscious of what we say and do and how to address and act towards others, especially elders. We needed to respect the always ongoing ceremonies around tipis and campfires. Already someone unknowingly tried to throw someone’s ashes onto a sacred fire. No pictures at all unless registered at media tent, out of respect but also to avoid creating evidence which could be used in court. This was not the place for Instagram. I felt a momentary rise of indignation, before the recognition took hold. I turned to Sto, who shrugged, then leaned over and whispered “We just gotta eat it dude.” Dude was exactly right. Daren talked about the treaties of Ft. Laramie, in which the Sioux were given rights over a swath of territory covering much of the Dakotas, Nebraska, Montana, Wyoming and Colorado. The treaty was never honored. Settlers and miners came searching for land and gold. In their wake sprouted towns and army forts to protect settlers from “hostiles.” The U.S. government’s treaties had expressly forbid settlement on native land, guaranteeing strong enforcement that was never meaningfully attempted. 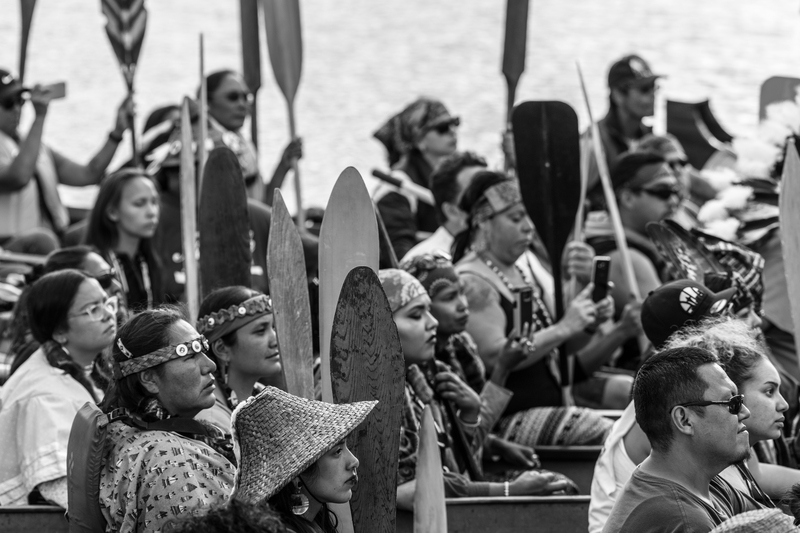 Instead the government tried to renegotiate to take more tribal land. The tribes who refused were hunted down and starved into surrender, the survivors confined to reservations where they were stripped of the right to a traditional life. In 1980, the US Supreme Court ruled the federal government’s land grab illegal and awarded the tribes $15.5 million for the land’s 1877 market value plus 103 years of interest at 5% for $105 million more. 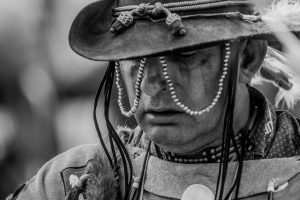 The Sioux never accepted payment. They want their land back. The meeting ended and we walked out into the sun. Everyone seemed sobered and contemplative from the weight of what had been said. We split up, Ash going to the medical tent to see if she could put her skills to use. Sto, Paolo and I walked through camp, rehashing orientation, trying to unpack it. We walked by the woodpile, where guys were swinging axes and tossing more pieces of firewood into an already huge pile. Despite its size we already knew firewood was one of the camp’s main shortages. The local area had been picked clean and it was the only way for most folks to keep warm at night. We made it over to Red Warrior Camp, where people were painting and making signs. Lunch was also being served up to any and all who wanted. We looked up to the ridge overlooking camp from just across the main road, a high point with fluttering flags and a few small clusters of people along the fence line. We made our way through the dry tall grass and took a long look once we got to the ridgetop. It was an impressive vantage point- views of Lake Oahe, the surrounding hills and the Dakota Access Pipeline construction site. We followed the fence line to a small rise where a knot of people were cautiously peeking out at something. We walked over to see what they were looking at. 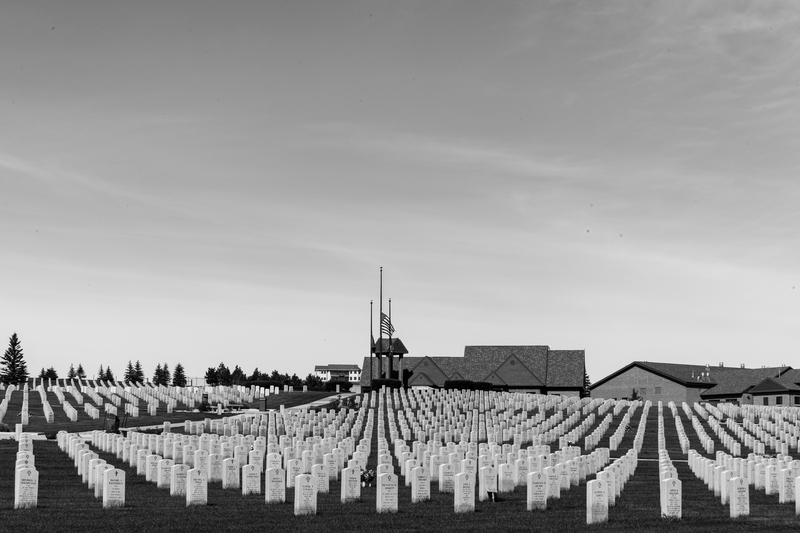 The rise dropped steeply to the road below where a few hundred yards away, a dozen black, tan and green military style armored vehicles stood behind mobile barbed wire units. This was the police blockade blocking access to the Backwater Bridge. Nobody was actually visible, but presumably there were people in the vehicles. It felt like we were scouts observing the enemy’s position. For a moment I wondered whether they might decide to lob a teargas canister our way. Closer to the camp from the armored vehicles was the charred steel carcasses of a burned out truck and an electronic highway sign. Tired, our legs aching from being on our feet all day, we headed back to Rosebud for dinner- fry bread, the Native American staple, and venison-bison stew with wild rice and vegetables. I dipped the ladle into the liquid and out came a big meaty bone with marrow in the middle. Ash didn’t think she deserved it but I told her it was hers, her lucky day. It made me remember what my friends in Mongolia had said about the marrow, how rich and nourishing it is, how they make it into a broth for children and for the sick. I also thought about the wolves I’d tracked in Wyoming. It was rare to find a bone at their kills with the marrow left inside. We walked over to a little dining tent with a few tables, though most were just sitting on the floor. When we came in some people were almost finished and insisted we share their table. They were a young, pierced and tattooed native couple from the reservation, wearing almost all black and with two small children. They watched their children eat, smiling faintly and talking to each other quietly in English. While we were eating a native elder came up to Ash and said there was going to be a woman’s sweat ceremony in a little bit if she wanted to join, so long as she wasn’t on her moon. Of course she did. She left me a little jealous, and the remaining three of us headed off to the youth council and candle ceremony we’d heard announced earlier that morning, which now felt ages ago. The youth ceremony was in the far corner of the camp in a flat grassy open space encircled by seven tipis representing the seven tribes of the Great Sioux Nation. When we got there there were already at least a hundred people gathered around the flickering fire, waiting for the meeting to begin. Many of them were holding little lighted candles that set their faces aglow. As we waited, a white, bearded, twenty-something year old wearing a keepah over his long blonde hair came up behind us and asked in a whisper whether we wanted candles for the ceremony. We thanked him and each took a candle, then asked him if there was a strong Jewish contingent here. He told us a number of rabbis had come, some with their congregations. Two young guys were hovering at the edge of our conversation, and the bolder one jumped in and asked the man if that hat he was wearing was a yamakkah, and if that meant he was Jewish. Yes, he answered to both questions. The other, younger guy asked if he had prounced it right, “yamakkah”. He had. He said they hoped they weren’t being rude with their questions. The bearded Jewish man smiled and told them no, it was perfectly alright to ask. It was a funny, good-hearted exchange. It was also revealing. The Jewish man’s demeanor was calm and humoring. He seemed like a good teacher who understood the unique opportunities for insight and intersectionality the camp created. The two young questioners- suburban giveaways from their nice clothes and innocent sincerity- seemed genuinely interested and excited to be meeting a Jewish person. They probably never had. The youth leader went on to talk about why we were gathered that night. “Last week, water protectors were having a prayer ceremony at the Backwater Bridge, below a sacred hill where our ancestors are buried. We were there to pray to our ancestors, to ask forgiveness for the police who were disrespecting them with their militarized presence. When we tried to cross the river the police attacked us with tear gas and rubber bullets at point blank range. They treated us like we were not human. Many of the water protectors who were attacked and hurt that day are here with us now. Tonight we go back to pray to our ancestors, to ask them to forgive the police for their actions, and to forgive us for any harm we have done or any disrespect we have shown to our sacred places. We go back to cleanse the site, and to cleanse ourselves of the violence and ugliness that took place there. We don’t know, but it’s possible the police will be there again. If so, remember brothers and sisters, to be strong, to not lose heart and to take courage from those around you. Mni Wiconi!” “Mni Wiconi” the crowd yelled back, then started moving out. Sto and Paolo and I looked at each other quizzically. No one had said anything about this being an action, but we were already moving with the crowd in the direction of the Backwater Bridge, candles in hand. I felt a small surge of nervous excitement. Quietly, I hoped it didn’t turn into a repeat of the week before. I had seen the images of the police brutalizing the water protectors at prayer. As we passed the fire I knelt, using my hand to wash smoke over myself as I saw others doing, for protection. We walked in a long column down a rutted dirt road through the dark, the moon lighting our way. 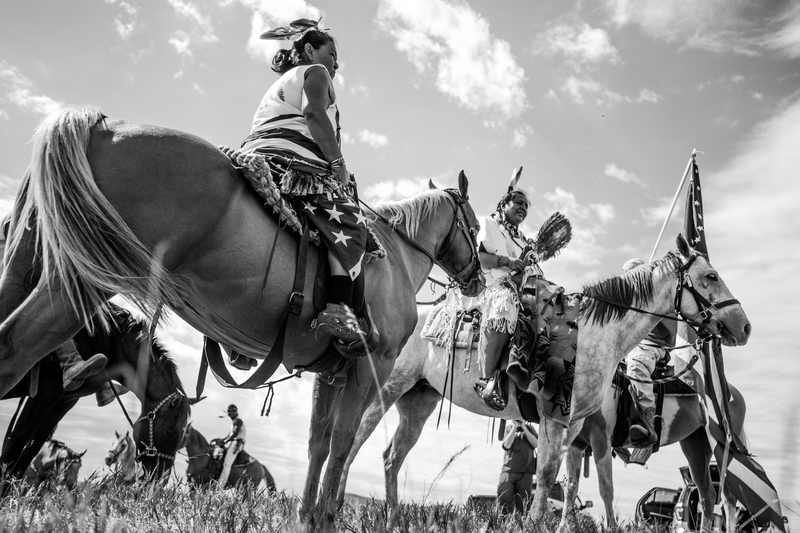 Riders occasionally raced back and forth along the flanks of the column, whooping as they went and sending waves of energy through the crowd, triggering cheers, shouts, more whoops and cries of, “Mni Wiconi!” Then all would be silent again except for the sound of marching feet. Headlights shone from trucks driving along the dirt roads crisscrossing the floodplain, and from parked cars in the fields ahead. I wasn’t sure who’s vehicles they were, ours or the police. After marching for what seemed a long time and a slow release of adrenaline, we reached the backwater- a muddy bank beside a muddy creek overshadowed by a steep dark hill and the full moon above. A huge bonfire was going when we got there, and everyone gathered around it. No police. No teargas. No battle after all. People chatted pleasantly. Sleeping babies were slung tight on a few parent’s chests, others awake sitting on shoulders. Older kids holding their parent’s hands. I was surprised by how many kids and older folks were there. It made me even more relieved the police weren’t. 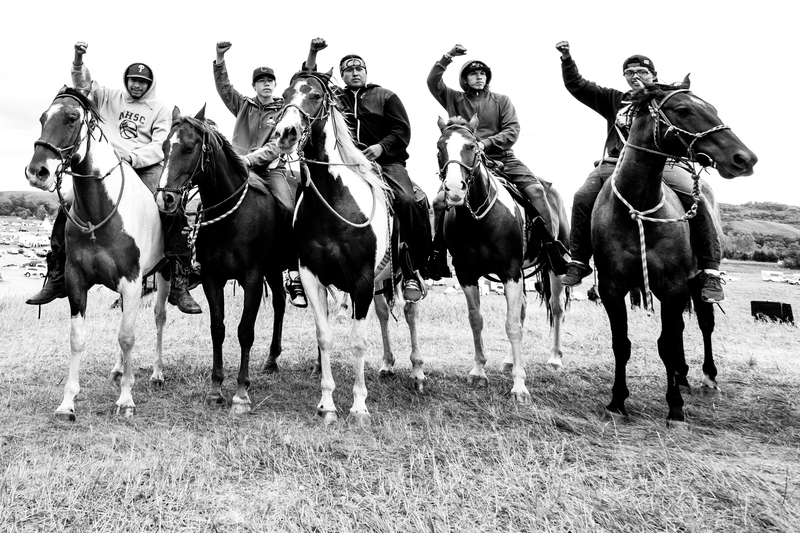 A group of warriors- young men on horseback, most of them Crow- also stood in the crowd, youthful male pride and confidence showing in their faces and swagger. The Crow had apparently brought many horses, and their riding abilities were legendary. The young warriors whooped loudly and called out jokes, enjoying the presumably rare opportunity of being the center of attention and entertainment for a big crowd of mostly white folks, a group they seemed to regard rather legitimately with some haughtiness. At one point the cockiest among the Crow riders, wearing a headlight and with a girl seated behind him holding tight around his waist, lost control of his horse, which got spooked by the crowd or the fire and nearly knocked the closest in the crowd with its flying hooves. There was panic in the warning voice of the girl riding behind him, but the rider regained control and no one was hurt. Soon after some of the native youth in charge of the show started to sing and drum, forming people into a circle that began to slowly move clockwise around the fire, neighbors holding hands and stepping along to the beat of the drum. “No DAPL girl,” the singer playfully sang, “she was so beautiful, that no DAPL girl.” We smiled. It was one of the same songs we’d heard at the sacred fire the night we first arrived. Before we left we walked to the edge of the backwater’s muddy bank, rendered a sloggy mess by many tromping feet. This was the exact scene of the other day’s violence. 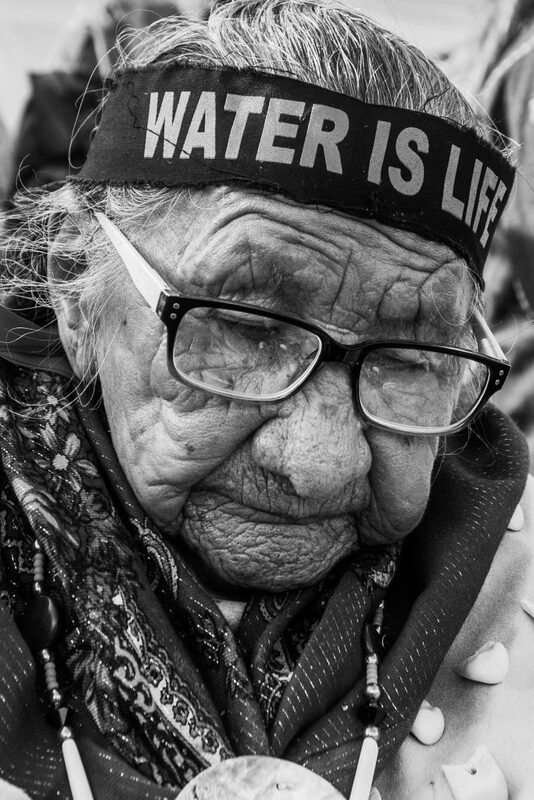 In Facebook videos, I’d watched the police spraying pepper spray directly into the faces of water protectors and elders who were standing in the water or kneeling on shore, hands held and arms linked for strength, continuing to pray, telling the police it was for them they were praying. Now, tonight, people stood on the same shore below, individually and in small groups, some staring somberly into the water or up at the moon, others with eyes shut tight, as if trying to squeeze out the images and scenes playing behind them. People prayed aloud and in whispers, crying, hugging, and holding each other. I looked into the moonlit muddy waters and meditated on why this was happening. I wondered how, in this day and age, it could possibly be allowed to happen. I thought about the incredible darkness of it all, and I remembered Daren’s words from earlier. I remembered that this and so much worse had already happened, for the same awful reasons, so many times before. After a long sigh, I turned to look for my comrades and saw Sto close by on the bank. He was standing alone too, looking into the backwater and up at the moon, brushing tears from his face. As we walked back to our tents that night, the North Dakota sky was pitch dark but for an eerie, unnatural white glow over the not-so-distant hills on the horizon. That ominous light was the DAPL drill pad, lit by massive floodlights that burned through the night, waiting to gouge through the soil underneath the Missouri river and right above the life-giving Ogallala aquifer- water source for America’s breadbasket- to pump the black, oozing, compressed carbon energy of long-dead plants and animals from their ancient resting places in the ground through thousands of miles of steel pipe all the way to my home state of Illinois, then on down the Mississippi to refineries and then to somewhere, or many wheres in the world, to be burned, to keep the wheels and factories and turbines going, to keep the engines of industry and the mouths of millions fed, with oil and gas and grain and soy grown in vast, uniform fields by more gas guzzling machines, all as the one great big mess of a machine runs reckless headlong and blind into the fast-approaching future. My eyes open and I am awake in my tent. It is dawn on our last day at Standing Rock, November 14, 2017, my 28th birthday. I slip a shirt on and unzip the tent door to greet the day, only to find everything obscured behind deep, impenetrable fog. I can hear the morning prayers coming from Oceti Sakowan camp across the river- slow-spoken, healing words that fill and calm my soul. I savor the moment and the feeling, knowing I will miss waking up this way. It is still dark out as Ash and I break camp, the ground under our boots crunching from last night’s frost. We greet the guard at the gate and quickly cross the bridge over the Cannonball, the rising sun peeking through the the trees and hills now starting to burn up the fog, painting fire across the sky and the still mirror of the water. Tipi poles and sun rays break through the dissipating vapor as the camp comes into view, a smoky haze still hanging over it. Whatever else it is or is not, the Oceti-Sakowan camp is awfully beautiful. We hustle through the camp, past the dome up towards the sacred fire, to catch the end of prayer. We get there just in time, as an elder invites up any males who want to participate in the men’s pipe ceremony. Of course I do. There are fifteen or so of us in the circle- the lead elder wearing a ceremonial shirt of red, yellow and blue, an old native Army vet wearing his uniform, one very old native man, and several younger ones. Inevitably, there are also some white dudes like me- mostly bearded, long-haired, and of the “hippy” variety but a few with nice, suspiciously clean-looking boots and coats. They look like they’ve been here even shorter than me. There is also the one-armed Vietnam vet from the action meeting, a Jewish-American Palestinian-rights activist, a Tibetan monk in saffron robes, and a black guy with dreads. Quite the crew. The elder lays out his materials beside the sacred fire and offers some tobacco, praying in the four directions of the wind. He takes his time preparing the channupa for smoking, telling us how important it is to go slow, to treat the process with respect. Everyone does it a little differently, he tells us, but this is how he was taught. The little differences are not that important. Once the pipe is packed and ready to smoke, the elder has the army vet to his left light it. The first two matches break. The elder smiles and chuckles a bit. The pipe lights on the third match, but accidentally gets passed counter-clockwise- the wrong way. The elder says “man, we’re off to a rough start” and laughs along with the rest of us. He tells the native youth who passed the wrong way that it’s okay, we’re all still learning. Plus, he says, we should never take anything too seriously. Now the elder carries the pipe clockwise around the circle, handing it from one man to the next. When it is my turn I take two puffs and hold the smoke in my mouth like the others, not letting it down into my lungs. I let the smoke out slow, using my hand to wash it over my head. I bring the channupah across my heart, from one shoulder to the next as we were instructed, before carefully returning it to the hands of the watching elder, who nods approvingly before walking on. 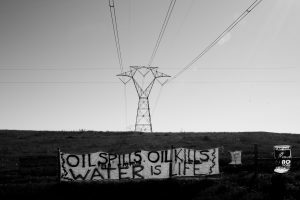 Days before I finished these words, the last holdouts at Standing Rock are evicted, by armored vehicles and soldiers in fatigues advancing through the mud, holding assault rifles and slashing open tipis as others burn nearby, set alight by water protectors who destroyed them rather than let them be ransacked by soldiers and police. Doug Burgum, the Governor of North Dakota, disregarded pleas to allow more time for an orderly evacuation of the camps noting the the garbage left behind. It could cause pollution that would threaten the health of the Missouri River, he said. Mikael Russell Cejtinis a graduate of theYale F&ES. He is a tracker, writer, and fly fisherman who has studied wolves in Wyoming and pumas in Argentina.